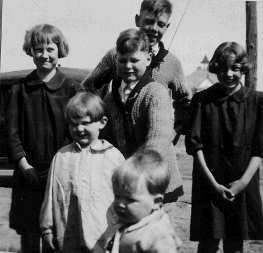 When I was a very small girl we lived in Salina, Kansas - my mother and Father, my sister, Iris, and myself. I remember visits to my grandfather's farm near Hill City, where we had so much fun. At that time Aunt Hazel and Uncle Elmer were there and they would play 'hide and seek' with us - there were so many delightful places to hide around the farm, especially just before it began to be dark and bedtime for us. One time Uncle Elmer sat me in his lap and taught me to sing, "I ain't got nobody, I'm going back to the farm - and feed the pigs and chickens - for I don't give a good gosh-darn". Grandma Quint really got after him for teaching me "bad words". And Uncle Elmer laughed! Later on we moved back to Hill City where we had lots of aunts, uncles and cousins, and there were always things to do. Although we lived in town, we spent our summers on the farm at Aunt Jennie's and Aunt Florence's. Aunt Jennie had a big three story house - the third floor was our haven - there were stacks of "Youth's Companions" Magazines to read, and all kinds of other things that Aunt Jennie had accumulated through her years of teaching. There were also clothes that we put on to play "dress- up" - floppy hats and high button shoes. When our cousins, Herlan and Lavon Loyd came to visit, too, Aunt Jennie had a house full. I am sure we led her a merry chase. At Aunt Florence's we "helped" with the harvest - I am sure we were more of a hindrance than a help, but we loved it, especially Aunt Florence's delicious fried chicken and fruit pie. Uncle Arthur was so jolly and played croquet with us. He also let us tag him around the farm and play in the hay loft, which was filled with nice smelling hay. I once poked my finger into the windmill and ran crying to Aunt Florence - the end of my little finger was severed! Aunt Florence stuck it back on with iodine and a bandage, and it healed nicely - no doctor could have done better! One summer we were invited to stay with Aunt Hazel and Uncle Phil at Wallace, Kansas where he was as station agent with the Union Pacific Railroad. Since they had no children of their own yet, they really spoiled us, and we had a wonderful time. I remember climbing up into the rafters of the freight shed, and how scared Aunt Hazel was. She called Uncle Phil and he very calmly "talked me down". He should really have given me a few good smacks on the backside! Much later it was Uncle Phil who taught me to drive a car. My father had tried, with no success because he was impatient with me. Uncle Phil was very patient, and one time when I was most certainly headed for the ditch, he calmly put his hand on the wheel and said, "Just turn it this way, gently". I did and everything was all right. I remember Grandpa Quint as a stern, but very kind man. I am sure that his grandchildren just never knew what to make of him. I recall my mother saying that they had all respected their father, but that he was never on to "cuddle" them, and that, perhaps, he was so busy with their livelihood that he left all that sort of thing to their mother. 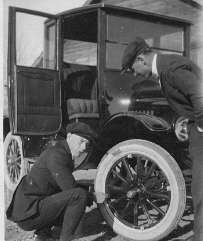 Grandpa owned a Model T Ford, of which he was very proud. One day I asked him if I might take the Ford and go for a ride. He was listening to the radio, possibly with more attention than to me, and he asked if I knew how to drive. Of course I said that I could - I was not more than twelve years old. He gave met permission and Iris and I asked some of our friends to go along. We rounded the corner on Main Street on two wheels! My mother was just coming out of a store. She ordered us to stop and proceeded to spank me then and there! We left the car there and Mother Marched over to tell Grandpa just what she thought of his letting Iris and me take his car out. I never did know just how the car got back to Grandpa's house, but I know I never again wa behind the wheel. I remember Uncle Elmer as a "gay young blade" with a Model A Ford and when he drove all the way to Colorado to court Aunt Veva, we were so exited! It was fun to have a pretty new aunt. These are only a few of the things I remember about my childhood- there are many more. It was a happy one, despite the fact that we hadn't much money. I Think my grandparents would be happy that I am now living in Illinois, the state that was very dear to their hearts.